Accumulating data indicate that intestinal dysfunction and dysregulation of the gut immune system may play a role in the development of type 1 diabetes. 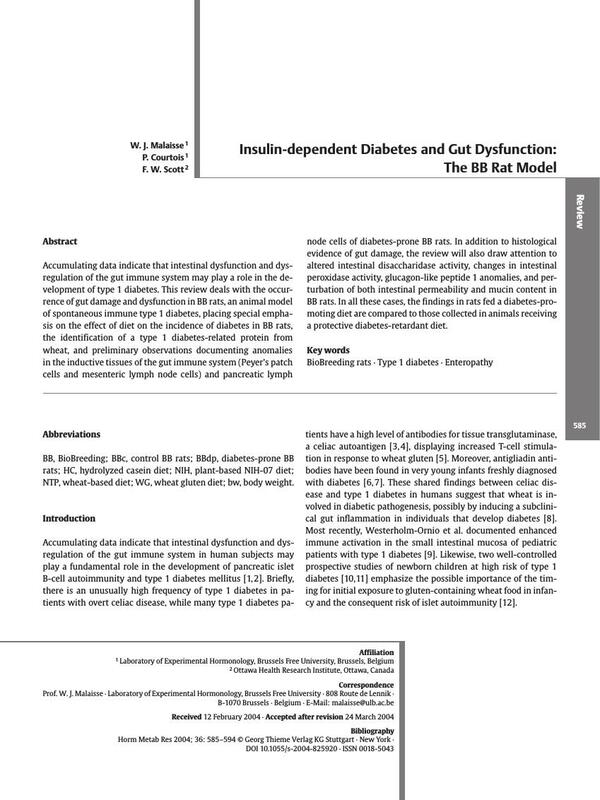 This review deals with the occurrence of gut damage and dysfunction in BB rats, an animal model of spontaneous immune type 1 diabetes, placing special emphasis on the effect of diet on the incidence of diabetes in BB rats, the identification of a type 1 diabetes-related protein from wheat, and preliminary observations documenting anomalies in the inductive tissues of the gut immune system (Peyer's patch cells and mesenteric lymph node cells) and pancreatic lymph node cells of diabetes-prone BB rats. In addition to histological evidence of gut damage, the review will also draw attention to altered intestinal disaccharidase activity, changes in intestinal peroxidase activity, glucagon-like peptide 1 anomalies, and perturbation of both intestinal permeability and mucin content in BB rats. In all these cases, the findings in rats fed a diabetes-promoting diet are compared to those collected in animals receiving a protective diabetes-retardant diet.